Warmian-Masurian Voivodeship or Warmia-Masuria Province or Warmia-Mazury Province (in Polish: Województwo warmińsko-mazurskie, [vɔjɛˈvut͡stfɔ varˈmiɲskɔ maˈzurskʲɛ], German: Woiwodschaft Ermland-Masuren, Russian: Варминьско-Мазурское воеводство), is a voivodeship (province) in northeastern Poland. Its capital and largest city is Olsztyn. The voivodeship has an area of 24,192 km2 (9,341 sq mi) and a population of 1,427,091 (as of 2006). The Warmian-Masurian Voivodeship was created on January 1, 1999, from the entire Olsztyn Voivodeship, the western half of Suwałki Voivodeship and part of Elbląg Voivodeship, pursuant to the Polish local government reforms adopted in 1998. The province's name derives from two historic regions, Warmia and Masuria. It is also the southern half of the pre-World War II German region of East Prussia. The province borders the Podlaskie Voivodeship to the east, the Masovian Voivodeship to the south, the Kuyavian-Pomeranian Voivodeship to the south-west, the Pomeranian Voivodeship to the west, the Vistula Lagoon to the northwest, and the Kaliningrad Oblast (an exclave of Russia) to the north. 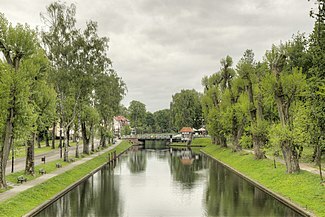 The region was originally inhabited by the Old Prussian clan of the Warmians from whom the name Warmia originated. During the northern Crusade, the Old Prussians was conquered by the Teutonic Order and their land was granted to the order by the pope and the region became part of the State of the Teutonic Order. The Order encouraged the colonization by German settlers in Warmia (Ostsiedlung) and Slavic colonists from the region of Masovia, who became known as the "Masurians". The Old Prussians became assimilated into the newcomers and thus became extinct. During the Teutonic rule, the region experienced a process of urbanization and economic boost due to the expansion of the Hanseatic League into the region. The Order later attacked their former ally Poland and conquered the region of Pomerelia, thus entered a long-lasting conflict with Poland, which subsequently entered an alliance with Lithuania. The war finally resulted in a rebellion of the urban population of Pommerelia and Warmia, who were affected by the Teuton's numerous wars; they accepted Polish lordship became an autonomous province of Poland-Lithuania known as Royal Prussia, while Masuria remained under the control of the Teutonic Order. The conflict finally ended when Poland defeated the Order at the Battle of Grunwald. The state of the Teutonic Order ceased to exist in 1525 when Grandmaster Albert Hohenzollern introduced secularisation, proclaimed the Duchy of Prussia and became a vassal of Sigismund I of Poland. The Prussian line of Hohenzollern was extinct by 1618 with the death of Albert Frederick and the Duchy was inherited by the Brandenburgian line; Prussia simultaneously entered a personal union with the electorate of Brandenburg known as Brandenburg-Prussia. The throne was inherited by Frederick I of Prussia who wanted to unite the Duchy with Brandenburg and also wanted to proclaim himself king of Prussia and therefore participated in the Russian-initiated Partition of Poland in which the province of Royal Prussia was annexed by the Kingdom of Prussia, and henceforth became known as East Prussia until 1945. Together with the rest of the Kingdom, the region became part of the North German Confederation, the German Empire, the Weimar Republic, and Nazi Germany. After the end of World War II, both the German as well as the Slavic Masurian population were expelled by the Polish government. Amongst the most visited sights is the Masurian Lake District, which contains more than 2,000 lakes, including the largest lakes of Poland, Śniardwy and Mamry. Other recognizable landmarks are the Warmian castles (Lidzbark Warmiński Castle, Pieniężno Castle, Olsztyn Castle) and the Cathedral Hill in Frombork, where German-Polish astronomer Nicolaus Copernicus lived and worked. The Lidzbark Warmiński Castle was later the residence of Ignacy Krasicki, nicknamed the Prince of Polish Poets. Święta Lipka in Masuria and Gietrzwałd in Warmia are popular pilgrimage sites. The Warmian-Masurian Voivodeship has the largest number of ethnic Ukrainians living in Poland due to forced relocations (such as Operation Vistula) carried out by the Soviet and Polish Communist authorities. In year 1824, shortly before its merger with West Prussia, the population of East Prussia was 1,080,000 people. Of that number, according to Karl Andree, Germans were slightly more than half, while 280,000 (~26%) were ethnically Polish and 200,000 (~19%) were ethnically Lithuanian. As of year 1819 there were also 20,000 strong ethnic Curonian and Latvian minorities as well as 2,400 Jews, according to Georg Hassel. Similar numbers are given by August von Haxthausen in his 1839 book, with a breakdown by county. However, the majority of East Prussian Polish and Lithuanian inhabitants were Lutherans, not Roman Catholics like their ethnic kinsmen across the border in the Russian Empire. Only in Southern Warmia (German: Ermland) Catholic Poles - so called Warmiaks (not to be confused with predominantly Protestant Masurians) - comprised the majority of population, numbering 26,067 people (~81%) in county Allenstein (Polish: Olsztyn) in 1837. Another minority in 19th century East Prussia, were ethnically Russian Old Believers, also known as Philipponnen - their main town was Eckersdorf (Wojnowo). Warmian-Masurian Voivodeship is divided into 21 counties (powiaty): 2 city counties and 19 land counties. These are further divided into 116 gminas. The Łuknajno Lake nature reserve (part of Masurian Landscape Park) is a protected wetland site under the Ramsar convention, as well as being designated by UNESCO as a biosphere reserve. ^ "Podolsk sister cities". Translate.google.com. Retrieved 2010-04-29. Wikimedia Commons has media related to Warmińsko-Mazurskie. This page was last edited on 10 January 2019, at 19:27 (UTC).